Many Scrum Masters ask me about this: “how can I help my team find the motivation they have lost?” Motivation or engagement seems to be a common concern for HR departments as well. So how do we create, develop, improve motivation in our teams? First, let’s develop our approach to motivation. We need to have a model to use and guide our decisions. Marc Löffler has looked at this from a Scrum Master and Agile Coach perspective and he invites us to think about passion insteadpodcasting about what makes great teams. His PASSION model is one possible model for us to use when reflecting on what makes our teams great. We will talk with Marc on Feb 15th about what is this PASSION model and how it helps our teams reach that level of productivity and turns into a positive spiral of engagement and motivation. Models aren’t enough, we need actionable tips! However, no matter what motivation model you use (and there are plenty), what really matters for us as Scrum Masters and Agile Coaches is: what can *I* do about it? Strong Vision: a vision that is understood, and shared with the whole team is critical. But that is not enough. The Vision for the team must be articulated in a way that drives self-accountability so that the team themselves can follow how well they are doing on the way to that Vision. Strength Orientation: a key aspect of the retrospective process is that we find problems and try to tackle them. But research has shown that we should focus a lot more on doing more of what already works well. This focus on the team’s strengths helps the team grow and develop further, despite some of the problems they will not solve. Just like you don’t berate a toddler when they fail to take their first steps, we should also encourage our teams when they succeed instead of punishing them or allowing them to self-punish for their failures. Independence: Great teams have a clear goal or Vision, but also own the process of getting there. A killer of motivation is having to follow a process you know does not work for you. Many teams are stuck in that rut, not because they can’t own the process, but because they feel guilty (and sometimes are made to feel guilty) for not following a specific process. As Scrum Masters we should discuss about what we can do to help teams grow their own process and own the outcomes of their work. 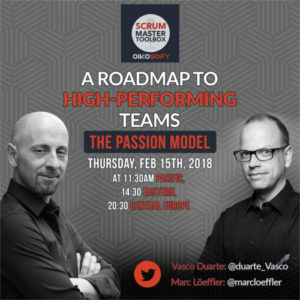 In the online meetup with Marc we will tackle each of the aspects of his PASSION model (and there are two more), and how we might act with our teams to help them climb that ladder to high-performance. In our role as Scrum Masters, we need to be aware of the models that are out there, based on experience from people like us, that struggle with the same problems we do. Marc is a very experienced Scrum Master and Agile Coach, and we can learn a lot from him. So let’s join the online meetup and prepare some questions to explore Marc’s experience. Share some of those questions already below or reply to the meetup confirmation email after signing up, and we will make sure we answer as many of those questions as time permits.